From Chicago, I meandered North for two days before arriving at a Bed & Breakfast in St. Ignace, Michigan overlooking Lake Huron. As I stepped onto the porch of the B&B I noticed two basketballs and my initial thought was the innkeepers had children. Walking into the lobby/living room I noticed several more basketballs, some resting on chairs and a velveteen couch. My second thought, Basketball fanatics I supposed, and at that thought, I heard a loud trump on the wall coming from the opposite room. Before I had a chance to ponder the source of the noise, innkeepers, Carmela and Jordan walked in and after extending a warm greeting, showed me to my room. True to form, in the room were two more basketballs for which Carmela apologized and removed without any forthcoming explanation. “Three years ago at a small garden shop in Chamberlain, South Dakota, Jordan and I bought a small unusual plant tucked away on a shelf, out of sunlight, and wilting very badly. Once back at our place, we re-potted the plant, watered it, and placing it in full sun at a living room window, it immediately revived. Like magic, the rejuvenated plant grew and several days later developed a center stem that started to form a bud. As the bud opened to flower, to our amazement, a basketball, we also noticed two hands started to emerge from the soil. Four days later, with the basketball reaching regulation size and us attending to an issue in another room, we heard the sound of glass breaking. Quickly we ran in to find the plant, minus a basketball, the front window with a large hole, and the ball resting on the front lawn. 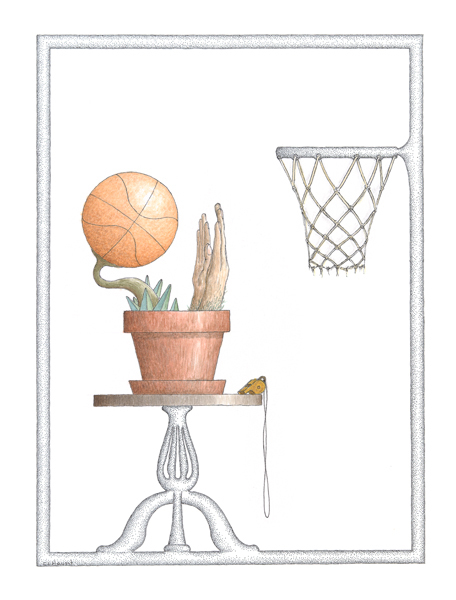 Mystified, we fixed the window and by week’s end, after another basketball bloomed, we happened to be in the room when the plant arched back and tossed the basketball just over the outstretched hands and through the front window again. Well, we couldn’t let this happen a third time, so Jordan moved the plant to an adjacent wall. Five days later we witnessed the same scenario but this time the outstretched hands managed to block the shot and it flew backwards onto the coffee table knocking over a vase of flowers. By weeks end, Jordan, now attuned to that window of opportunity when the basketball might be thrown, made me aware a shot was on the verge and offered a chair to watch. I took this picture just as Julius arched back for the throw. I watched as the ball sailed towards the basket, hit the rim, and rolled around twice before dropping in for the score. Larry, just missing blocking the ball by less than an inch, snapped his fingers in mock frustration and then semi-relaxed with the anticipation of another future chance. This morning while leaving, Carmela and Jordan bid me farewell and not surprisingly, offered me a basketball or two, or four. I willingly took two, promising I would give them to my grand-kids when I arrived at Ukazoo. I loved all the NBA player references! Very clever as always. I hope you blog contines after Ukazoo. I hope so too. Nine more Stops/Slides/Stories till I get to Ukazoo Feb 10th. I will then continue the Blog for the two months the Art Exhibit is displayed with examples of the new works and then what direction it takes after April 16th, I am unsure of at the moment.